If you want to run a successful online business, you know that SEO is everything. Search engine optimization helps you increase the performance of your website in order to make it more user-friendly and discoverable in the search engines. As a result, you can expect more sales through the website which is SEO-friendly because it is more likely to be shown in the search engine result pages. Every SEO strategy and planning starts with the keyword research. Keywords make a base for the website optimization, content creation and even for the paid search engine ads. This is why they are so important part, and it is crucial that you start with keyword research. Keywords are basically words or phrases you want to position for. This means that once that word or phrase is typed into the browser, you want your site to show at the top of the search engine result page. Being positioned at the top ensures that the users find your website and click on the link. According to numerous studies, the top results receive the highest number of visits, as opposed to the results shown below, while the results on the second, third and subsequent pages of the search result received hardly any visits. Site structure or site architecture is the way your website is built. In general, you should always have in mind SEO-friendliness as a factor when creating a website, when designing the menus, categories, etc. Everything should be well-organized and follow a logical structure, which is also something that the search engine crawlers will be able to follow. E-commerce websites usually have lots of pages. These are typically product pages, and there can be thousands of them. If not organized properly, these pages can turn into a huge mess, in which case it would be impossible to index the pages accurately and determine the relationship between them. Therefore, thinking about site structure is crucial. Start with the domain and go from there. You will have a couple of pages branching, such as home, about us, contact, products, etc. Now, each of these can branch into other submenus. You want to focus on products, or services if that is what you are selling. If you have a lot of products, try to organize them in categories. For example, if you sell tennis equipment, you can have categories clothes, equipment, shoes, etc. Then, inside each of these categories, you will further classify the products. Speaking of clothes, you maybe have T-shirts, shorts, socks, accessories, etc. A structure like this one makes pages more organized and easier to find, for both the users and the search engines. Does not use the stop words (and, or, but, the, etc.). When creating URLs for an e-commerce website, you should not use numbers or other abbreviations for the product page name. Instead, use the product name and make this also a part of the URL. Internal links are the links that point to other pages of your website. In terms of SEO, internal links help website crawlers to discover new content on your site. It works like a giant spider web. A search engine crawler gets to one page of your website, and then from that point, it crawls to the other pages. Without the internal links, the crawlers would consider this one page independently and would neglect the other pages. When you create a good structure of your e-commerce, you do a pretty good work in arranging internal links. The navigation is created through the structure, so every product page links to the other internal page which actually has higher priority. For example, the product page links back to the category page, and the category page links to the menu. Website content is presented in a way search engine crawlers see it. Google, for example, needs to understand the content in a better way, so that it can present this content in the search results more effectively. Apart from the search results, Google can actually present content in a useful way in Gmail as well. This is done through rich snippets. These snippets improve user experience with enriched information and presentation that is more engaging. To take advantage of this feature, all you need to do is tell Google about the data on your website. In terms of e-commerce, you will use “Product” as the data type. 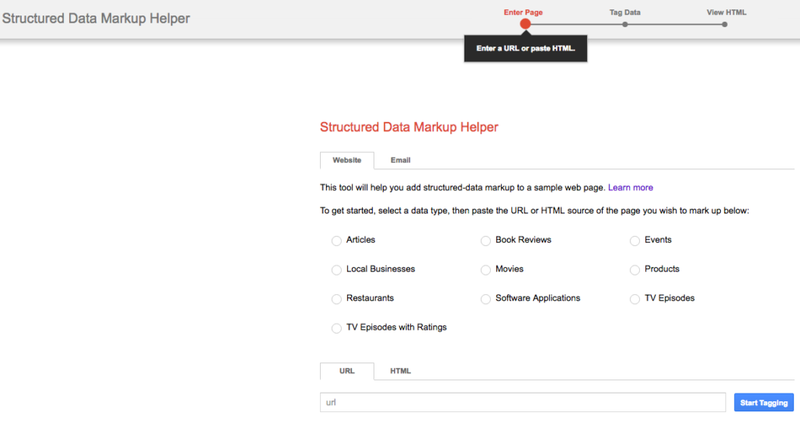 Provide the URL or HTML of the page you wish to markup and once you finish it, you will get schema.org markup which you will add to the pages on your website. The same process can be done for email, so that Gmail presents the data in a new way. On-site SEO is the process of optimizing website pages to make the website more SEO-friendly, and thus increase the performance of its pages in the search engine results. This process requires a series of actions to enhance the performance. You need to follow the guidelines related to content optimization, image optimization, etc. This is what is typical for most websites, but for an e-commerce website, on-site SEO also has to focus on product pages and their optimization. Title tag represents the title of the page. It is marked with an H1 tag (heading 1), and it has the greatest importance for the search engine crawlers. Typically, you should use keywords in the title tag. When it comes to an e-commerce website, your goal should be to aim for a more specific keyword phrase (a long-tail keyword). These actually contain words like buy, online, cheap, best, etc. These words help you create long-tail keywords that perform better as they will attract the right traffic. For example, if you use keyword “buy tennis equipment” in the title tag, the page should appear when someone uses this phrase in the search query. And someone who conducts this kind of query is usually interested in completing the purchase. Of course, these do not apply to product pages, which should have product names instead. Product pages are an essential part of e-commerce, but at the same time, they are what makes e-commerce SEO different from the usual website optimization. Unlike content articles, which provide a lot of content, which is optimized and thus accessible and indexable by the search engines, product pages might become a challenge. Firstly, they do not have as much content. The main content on these pages is actually product description. Secondly, product pages usually focus on visual content, such as images and videos. Visual content is more successful at grasping the attention of the visitors. Additionally, the features and usefulness of the product are much better illustrated through the visual content, which makes it more effective in terms of persuading customers to buy. Google uses content to learn what your page is about. When you provide this content, you instruct Google how to index your page and when to show it in the search results. This is why it is essential for the content to be relevant to the actual product. You will also need to use keywords, but always make sure that you use them naturally in the text, along with the synonymous phrases. Regarding content length, the industry statistics show that “long form content of over 1,000 words consistently receives more shares and links than shorter form content” (Source). Even though this might be a difficult goal to achieve if you have thousands of product pages, you could at least provide lengthy content for the most important pages, such as the main category page. Try creating more content to enrich those pages and make them more SEO-friendly. Since they are an essential part of an e-commerce website, product images and videos should be SEO-friendly as well. When it comes to the users, the most obvious requirement is that the visual content is relevant and of high-quality. On the other hand, the search engine crawlers are unable to see content this way. Instead, they try to understand what the content is all about. How do they do that? Using HTML tags. Name – Start by file name. Always make sure the file name is descriptive and, if possible, use keywords in the file name. Size – High-resolution images are a fantastic presentation for the website visitors, but they might cause optimization problems for your website, such as decreasing site speed. Therefore, make sure to use a tool to change the format or compress the file when uploading images and videos to your server. These will help you preserve the quality and reduce the file size. Alt text – Alt text or alternative text is a phrase or a part of the text that is displayed when the image file cannot be uploaded and shown to the viewer. Alt text enables search engines to understand what the image file is about because the search engines on their own cannot see the images. As a result, this helps them index the visual files correctly. Related products feature is great for two reasons. Firstly, it shows similar products to the customers, which can increase the chance of them finding new products on your website. The other reasons why you should have this feature is the fact that the related products are actually links to other product pages. Like mentioned in the part about the site structure, for search engines crawlers it is essential that you interlink pages and make logical connections. This will provide the search engines with additional context to understand and index the product pages. Finally, e-commerce websites with lots of products can have thousands of product pages. Not only is it a lot of work to optimize each page, but additional problems might occur due to the fluctuation of products. When you have lots of products, it usually means that you will often get new products, some of the old ones will be discontinued, etc. What it all means is that you will need to develop a system to track all of these pages and keep an eye on changes. Maintenance of an e-commerce website can be an arduous task, and the best way to make it work is to keep everything organized. Start with a great website structure, which is yet another reason why you need to assign product categories and subcategories. In terms of products, we can differentiate between two types of e-commerce websites. First, there are those that sell a limited number of products, which are usually pretty constant. This means that they are unlikely to update product pages often. Websites that offer services also do not change their pages frequently. The offer is usually the same and rarely changes. In these cases, website maintenance is somewhat simplified, because once you create and optimize the product pages, that is pretty much it. On the other hand, we have more dynamic types of websites. These are the sites that have a lot of products, sometimes even hundreds or thousands. Apart from this large amount of products (and thus product pages), there is a need to keep an eye on the product inventory because some of the items might be sold out, some might be seasonal, so they are only sold during a particular period of the year, etc. Since these websites are dynamic, the product page information change frequently. Unfortunately, this leads to a lot of product page issues which can result in broken pages, incorrect or obsolete information, etc. 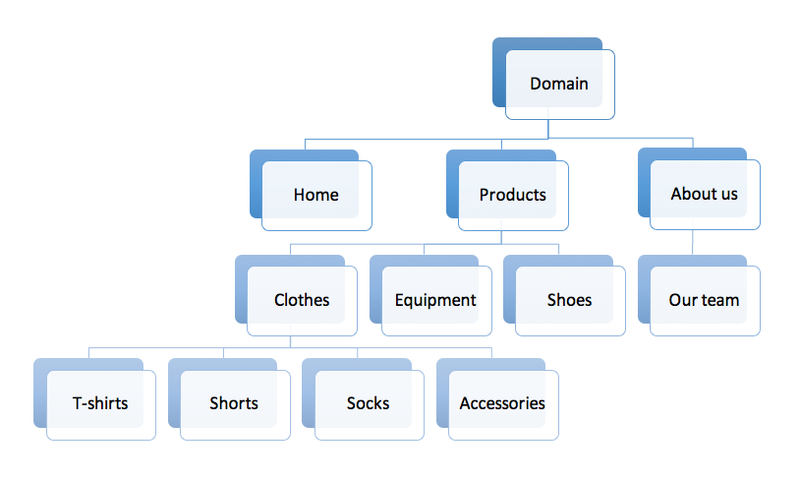 Every time there is a new product added to your website, think about your site structure. You have to add the product page to the right category, and you have to optimize it based on the guidelines above. You could also add “New” sign to the product page or even create a special category with the newest items. 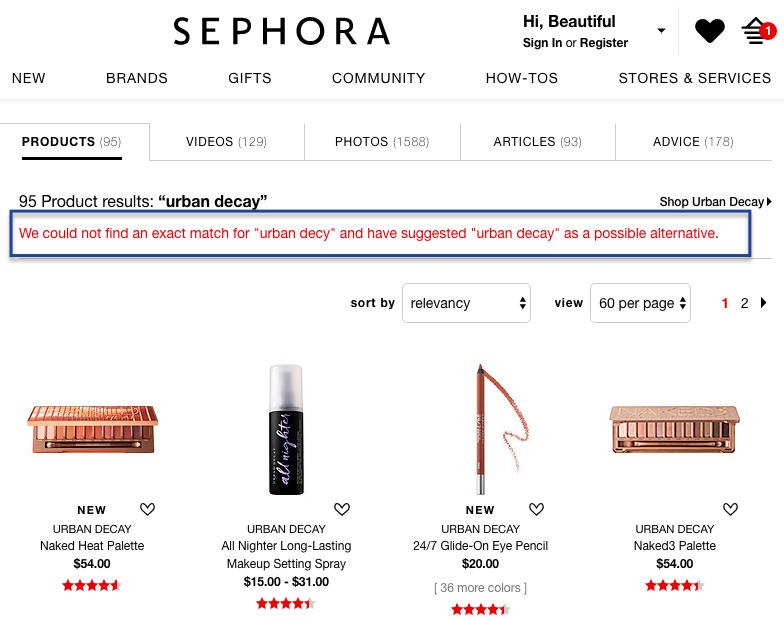 If the product is out-of-stock, but it will be back soon, you should just leave those pages up with a message that the product is currently unavailable. This way you keep the ranking of that page. As for the users, it is helpful if you could provide the date when the product will become available (they can leave their email to get the notification), or you could offer alternatives, such as the products in a different color or a similar model. When the product is expired and will no longer be available, you have two options. You can either delete the page, in which case some users might be arriving at the 404 error page. Alternatively, you could use 301 redirects. In this case, the users will automatically be redirected to the new page. The good thing about 301 redirects is that they pass link juice from the old page to the new one. So, if the expired product page was ranking really well, this will transfer to the new page. 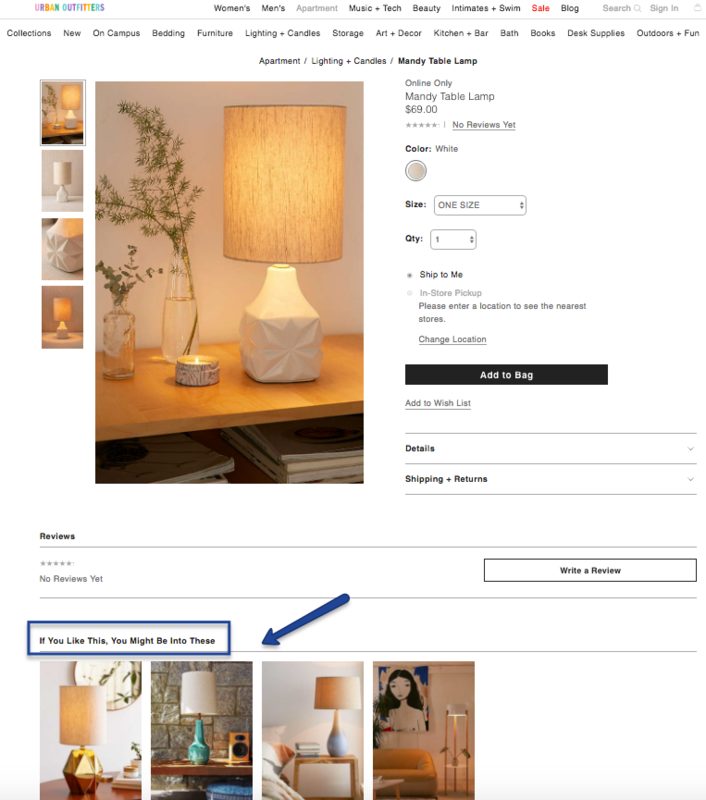 You could redirect to a new product page (for example, a new model of the product) or the product category page. When you have product variations, such as different sizes, colors, etc. you might have different URLs for those pages. However, you should always use the rel=canonical tag for the original product pages. This way the search engines will know which pages to prioritize, and you will avoid the risk of duplicate content because the description is likely to be similar or perhaps even the same. Since seasonal products are available for a limited time only, try introducing these pages earlier with “Coming soon” label. This will give you more time for the product pages to be live on the website allowing the search engines to index them early on. Labels such as “Limited series” show to the users that the products will be available for the limited time only, urging them to buy if they are interested. If each year, you bring out new products, use the year in the URL to make difference between pages. As for the old product pages, use a 301 redirect to redirect the users to the product category. Due to this dynamic process of product page updates, you also have to update your website sitemap regularly. Since the sitemap holds all of the website files together, enabling the search engine crawlers access to read and index them, you need to keep it updated as the pages and links on the site change. 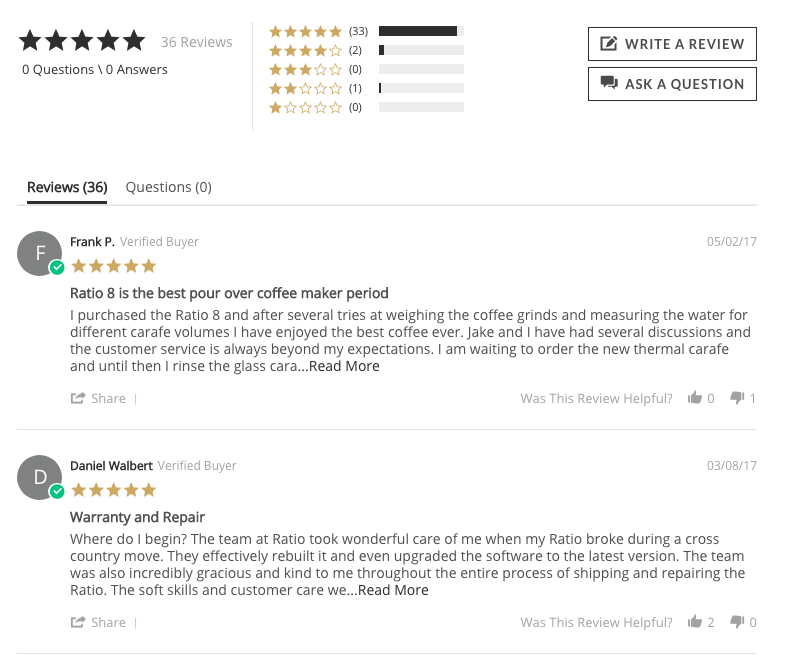 Install a plugin – You could install a plugin that will enable customers to leave their review. The review can feature customer’s name (or any other customer data if relevant, such as age, etc. ), a star review and a written review. The date when the review was posted could also be helpful for the future customers. You should not underestimate the power of site search. This option is very useful in e-commerce, and a lot of website visitors will use it to look for the products. This means that you have to optimize the internal site search results, so that even the users who type synonyms, misspell the product name or use spacing errors are eventually taken to the appropriate product page. This way you significantly reduce the chances of losing sales due to incorrect search results and because users were unable to find the right product using the internal search results. Analysis of the search results can also help you find out what the users are looking for on your website, which products are popular and how users interact with your website in general (for example, they might explore the category page first, etc.). This can help you understand the behavior of your customer in a better way, and it also shows you if you need to optimize or adapt certain pages to increase their performance even more. Link building is an essential activity of off-site optimization. The process includes a series of activities conducted to get more links to point to your website. The main benefit of these links is increased exposure. When a link to your site is placed on another site, you increase the chance of online users learning about your products. In terms of search engines, links are seen as a vote of trust, and thus they help with deserving better ranking in the search engine result pages. This is why gaining quality links (i.e. links from the authority websites) can be very good for your SEO. Track social shares, visits, etc. A partnership can be a very lucrative collaboration for business. The idea with this approach is to find another business that is somehow related to you, but it is not your competitor. For example, if your e-commerce website sells tennis equipment, your partner can be a local tennis club. This way, they could promote your brand, and in return, you could offer a discount or special offers for their members. Online marketing includes several segments, and one of those is affiliate marketing. With this type of online marketing, you become a merchant, and you create special offers for affiliates who decide to join your affiliate program. Once they join, the affiliates get unique codes that track sales originating from their campaigns. They can distribute these links in any way they see fit. For example, they might share an article on their blog. They might share on social media, or they might even send a newsletter to their subscribers. The point is that they are in charge of promoting your product (and distributing links online) and in exchange, they get a commission, which is usually a certain percentage of the sale. It is a very profitable strategy for merchants because they do not invest anything and yet, have so much to gain. What we can conclude is that optimizing an e-commerce website does have some distinctive elements, such as product pages, but in the core of each website optimization should be the user. Everything you do here is to improve the website performance for the users. This refers to the entire structure, link building, and even mobile optimization. All of this provides better user experience, and this results in more visits and more interest in your brand. Ultimately, this leads to more purchases and more exposure through recommendations. Think about your potential customers and how they would browse, what kind of information they would need, etc. All of this helps you learn how to design your website and present products. In the end, do not forget about the search engines. Even though we are way past this phase in marketing when optimizing for the search engines was all marketers were focused on, it is still essential to enable the crawlers to access and understand the content of your website, so that they could index and rank it successfully. However, this user experience component is believed to have influence here as well, because the crawlers are now learning to evaluate how users interact with your website, how long they do so, etc. This is supposed to show them how exactly your website is helpful and providing better user experience ultimately means that your website will probably rank better in the long run.